In May, NFL owners unanimously approved a new policy that requires players to stand if they are on the field during the performance of the national anthem. The controversial new policy gave players the option to remain in the locker room if they so chose. This was meant to stop athletes from kneeling in silent protests aimed at raising awareness of racial and social injustice. The policy was put on hold, though, after the NFL Players Association filed a grievance, challenging it on the grounds that it infringed on players’ rights. While the players and the league battle it out, a new player has entered the game: Beef O’Brady’s, which is not a new addition to the Jacksonville Jaguars but a Florida restaurant that’s trying to force the NFL’s hand. 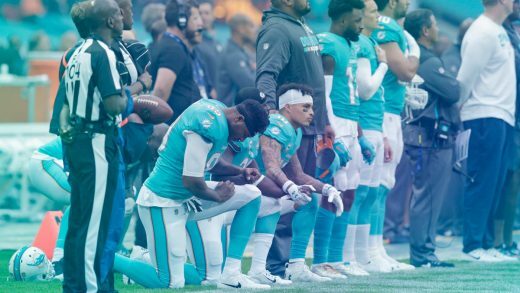 According to FOX 13, the Brooksville, Florida, restaurant has posted signs explaining that it will not support the NFL this year because of its “lack of compassion and gratitude for our American service members.” While the players engaging in the protests have repeatedly stated that the protests have nothing to do with veterans, that smear tactic has been repeated by President Donald Trump and others in an attempt to undercut the players’ message. There’s no word on whether the NFL has noticed the diminutive protest yet, but Yelp commenters have. The restaurant’s page is now split into one- and five-star reviews, as people critique the politics and the quality of the chicken wings.